Upland Sports Group, Inc. announced today the official launch of Capoforma, a new and innovative brand of active and lifestyle cycling apparel. The distinctive, European-inspired collection includes a complete line of men's and women's in-line, custom, and casual cycling apparel and accessories. The Capoforma brand was developed by Upland Sports Group, Inc. in response to the growing need for a new line of cycling apparel offering a balance of technical performance, superior comfort, and progressive style. The Fall 2006 collection is currently available and the Spring 2007 collection premiers this fall. The Fall 2006 collection features many unique models and styles, each carefully designed and developed such as authentic Retro Wool Jerseys, premium Lana Base Layers, casual Felpe Trainers, technical Mortirolo Rain Jackets, and all-season socks featuring the most advanced fabrics in a variety of styles and color choices. Premiering in September, the Spring 2007 collection will offer a complete line of men's and women's in-line and custom apparel, casual apparel, accessories, and socks. 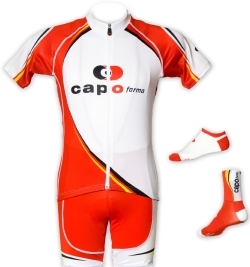 The offering is highlighted by the introduction of the Capoforma Signature Series collection of jerseys, shorts, bib shorts, and accessories, each developed using the finest fabrics and modern design technologies. Capoforma was first introduced to the marketplace in early 2005 and quickly gained acceptance among retailers and cyclists alike as a brand known for matching premium quality with distinctive style. The initial offering included both In-line and custom socks along with casual and custom team apparel. "We are very excited to have evolved and expanded the Capoforma brand into what we believe to be the next-generation of active and lifestyle cycling apparel. Ownership of the brand allows us to drive both product and market development from beginning to end to truly meet the demands of the U.S. marketplace." said Robert Carbone, Vice President of Upland Sports Group. Since 2002, Upland Sports Group has become well known for their ability to deliver European style and quality to the U.S. marketplace. As the exclusive U.S. distributor of Bergamo Cycling Apparel, Upland successfully designed and developed both in-line and custom apparel offerings over the past four seasons. In addition, Upland is currently the exclusive U.S. distributor for DMT Shoes. "For over four years, we've been developing and marketing superior products for enthusiasts, teams, clubs and corporations alongside some of the most innovative manufacturers in the European cycling industry. The expansion of Capoforma marks a significant change in our business that will enable us to continue to pursue our core competencies in the soft goods market and compliment our best of breed product offering", said Gary Vasconi, President, of Upland Sports Group. The Fall 2006 collection is currently available at bicycle retailers throughout the U.S. The Spring 2007 collection will be introduced at InterBike in Las Vegas, September 27-29 (Booth 2851). For more information on Capoforma products or to locate a dealer, contact Robert Cabone at 510-903-0129 or robert@uplandsg.com.